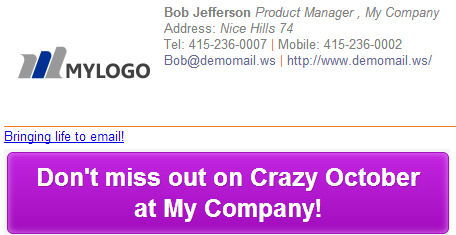 WiseStamp makes control over your company’s marketing message easy and fun. Every email sent from your company is a marketing opportunity – don’t miss out on the thousands of emails your company sends! WiseStamp lets you easily update your marketing messages and see the statistics about their effect. Go to gapps.wisestamp.com, to the “Email Apps” tab. Click “Add app” next to the “Banner” app. You can repeat this as often as you need. Daily, Weekly or Monthly. WiseStamp automatically adds Google Analytics tags to all outgoing emails so you can track the click through rates in your Google Analytics and know which campaign is the most effective.